Reality Self Defence Blog » Uncategorized » Are you actually ready for training, coaching or advice? Are you actually ready for training, coaching or advice? This is a summation of a few articles from a well known Strength and Conditioning and kettlebell coach I have followed for years in the US. Mike Mahler put out these articles some time ago (years); along with this summation of his articles (read: plagiarized) I have added my own thoughts and experiences over the years I have had with challenging clients. I hope you enjoy the read-it’s an interesting subject on mindset. So do you think you are ready for training, coaching or advice? Sure. Sounds a bit cheeky to ask doesn’t it? Besides you’re a customer and you’re paying for it right? Perhaps not. Read ahead and let me challenge your perspective on that. On consultation with some of my closest clients/friends for them it boils down to what their goals are and how badly they want to achieve them. Their belief is if the desire is there, commitment should follow. That’s why they are getting results. Most important things can only be learned in the process of doing them. You do something and you get feedback–about what works and what doesn’t. If you don’t do anything for fear of doing it wrong, poorly, or badly or to make mistakes, you never get any feedback, and therefore you never get the opportunity to get better, learn or to improve. This is a scientific fact. When you are making the most mistakes is when you are learning the most!!!!!! It sounds counter intuitive but it’s true. Making mistakes–and lots of them–is simply part of the learning process. All successes are based on a ton of failures. Again, experience is the magic ingredient so crucial to valuing timely advice. So if you don’t get feedback you don’t learn. So this brings me to my first point. Are you ready for feedback and advice? Are you READY for it? If you are after a paid friend or a cheerleader for a coach, then guess what? Don’t get me wrong a positive feedback mechanism is important here too! But you probably won’t learn a thing. External gratification and false praise will not help you perform better unless you are prepared to make mistakes and take the criticism of a coach onboard. Feeling good doesn’t necessarily equal results. Constant refinement and improvement from both external and internal feedback mechanisms does. Do you think that the best athletes in the world “felt good” all the time they were being put through the rigors of their chosen sport? The need for external gratification subject will be discussed another time, but I digress yet again……….you need to be challenged mentally and physically to grow. So are you ready? Do you actually VALUE the advice you seek? An interesting thing about good advice is that it’ doesn’t usually benefit the recipient unless the person has enough life experience to comprehend the value. Part of learning what works is learning what doesn’t work. In other words until you discover that what you are doing is ineffective only then do you usually have the willingness to take the advice of someone else. When you don’t understand the value of the advice given, it doesn’t matter how great it is, you simply aren’t ready for the message. You’ve got to earn the ability to assimilate advice in order to benefit from it. In other words if you are at a kindergarten level in your schooling then you probably aren’t going to value a college professor coming in to lecture you. You just wouldn’t assimilate it or get it. No value. The college professor may just look like a geeky guy in a tweed jacket and coke bottle thick glasses boring you senseless. Generally, when things are going well (or at least we think they’re going well) we’re less open to advice. Try giving advice to someone who’s just begun strength training and you’ll know what I mean–remember when you first started training? In the first months trainees can make terrific progress on just about any program, so at this stage they typically aren’t open to any advice, thinking they know what they’re doing and that infinite progress is theirs. However, once their progress slows down to nothing or, worse, they’re injured, trainees may finally realize they don’t have all the answers after all. Not only are they now open to advice, they’ll actively seek it to get back on track…that, or they give up. Advice is a funny thing: some people love being in the advice-receiving stage. They just can’t get enough advice. No matter how much great advice they receive, they always feel they need more before even thinking about acting on any of it. Of course, seeking advice doesn’t mean you’re ready to receive advice. Often, advice-seekers attempt to postpone the inevitable while they safely remain in research (procrastination) mode. They tell themselves when they’ve done enough research and heard enough advice, they’ll take some kind of action. The problem is no amount of advice or research is ever enough. No matter the exceptional advice they’re given, they imagine they need still more. Somehow these people think if they can just secure enough advice, and carry out enough research, they’re safe from making mistakes. The fear of making mistakes is the fundamental reason so many people neither grow nor find their success; their anxieties about hard work and failure delay necessary action. The results? Their fears become a self fulfilling prophecy. And often nothing happens. People receive great advice all the time, yet few actually do anything with that advice. For the advice-receiving addict, the remedy will always be to seek more advice and delay action. The problem with this mentality is you can postpone your entire life remaining in advice-receiving mode rather than JUST GETTING STARTED. It is also what’s known as “paralysis by analysis”. Thinking that the advice may help us achieve our goals is exciting; however, at some point you have to go from the anticipation/excitement stage to the action stage. And once you start thinking about putting the advice into action, reality kicks in and you realize that following through on the advice is harder than remaining in the advice-receiving stage. You must take action with the advice you’ve been given before going back and filling your cup again. It is earnt. Next, let’s look at the people who hate receiving advice: they tend to be pretty miserable people. If you think you know it all, how can life be exciting? After all, one of the greatest joys in life is interacting with–and learning from–those interesting people who can profoundly affect your life. People who hate receiving advice are usually in repeat mode, wherein every year is the same–for years on end. Ten years go by and nothing significant has happened since the same year has repeated ten times over. The advice-haters may be action-addicts who are simply too busy making their endless moves to stop and benefit from any useful advice but, unfortunately for them, their personal growth, and enjoyment of life even declines–because they’ve failed to slow down and reflect. They think they know it all and don’t want any advice from anyone. They never seek advice and if they happen to receive it, they never follow it. As a result, their growth is hampered and at some point, usually comes to a screeching halt. You can only get so far with what you know: in order to go from where you are to where you want to be, you need to learn more and act more. Seen the movie Groundhog day? Conversely an action-addict’s action is a distraction device, just as advice merely distracts the advice-receiving addict. If advice-receiving haters were more open-minded, their action would be more efficient. The funny thing about advice-receiving haters is they love giving advice to others! After all, they’ve got the “know-it-all mentality” and feel an ego-boost and an ego stroke when others approach them for advice. More often than not, they prefer to disburse advice they themselves wouldn’t follow (the double standard or one rule for me and another for you-all you have to do is look at half the personal trainers out there) and the advice they give others is often negative: they’re the people who’ll tell you why your goals and dreams won’t work out rather than offering constructive advice. Just as they can’t take good advice, neither can they give it. And they are often pretty miserable people. Another category involves people who only seek advice, which is in line with what they currently believe. In other words, they’re looking for validation when they request advice, not objective advice. These advice/validation-seekers have only their illusion of open-mindedness–in reality they just want people to agree with them. They’ve made validation-seeking their goal rather than a genuine impetus for growth. Which means being brutally honest with yourself. You’re only going to learn so much from people who tell you what you want to hear and share your same views. In other words you need to be prepared to be challenged mentally. Someone patting you on your back is not that. To be challenged is to grow. I know this one all too much as well. Until I realized again I was beating my head against the same brick wall in the same behavioural patterns and needed to change. Rather than seeking sound and balanced advice, the advice/validation seeker is looking for someone who’s on his same page. Their motto is: I only accept advice that’s in line with what I already believe. These people hold the illusion that they’re open to advice and even benefiting from advice but upon closer scrutiny it’s clear they’re merely seeking validation. Because advice/validation-seekers aren’t receptive to the possibility that they’re in error, they never grow beyond their own egos. They simply follow their own advice, and when they doubt that, they look for external validation. Advice/validation-seekers simply don’t want to change and grow: they want to justify their behaviour. This is coined confirmation bias. And it’s very hard to fight even if you are aware you do it. It is enormously difficult to objectively judge a point of view you have already decided to disagree with. I used to believe people who paid for advice valued it most, but since being a trainer for close to 14 years now, and in some pretty upmarket and yuppie areas, I’ve witnessed numerous of my former clients paying for this advice then failing to act on it, as they take neither me nor themselves seriously, ending up dissatisfied with their lack of (desirable) results. I no longer believe this. Especially if they don’t value the money they earn or have inherited. Some people think spending money for advice is a sure thing, but it means nothing if you’re not following through on it. Buying advice doesn’t equal results. Only follow through does. And this “following through” is much harder than getting the advice in the first place. What happens if I have met my goals? Again the feedback I have had regarding this is “well I have worked so hard to get to where I am I don’t want to go backwards”. Fair call. There is another old saying that goes “it’s a lot harder to rebuild than to maintain”. Another strategy is to simply set some new goals whilst staying in the “maintenance stage” of your training. It’s far better to aim for small improvements than to go through the whole process again. So if motivation slips it’s always a very positive thing to remind yourself of how far you have come and more importantly why has it been important. People fall into these because of cognitive biases and they often happen without conscious control. You are not a bad person if you have these biases-everyone does. But you do need to be aware of them and their existence in your thought process for you to correct them. 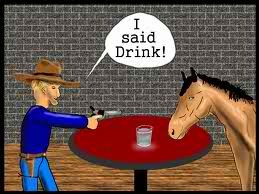 As the saying goes, “you can bring a horse to water but you can’t make it drink”. I remember watching a current affairs program dismissing the value of personal training as some people weren’t getting results, not appreciating the fact that it is the responsibility of the client to go out and do what they have been asked to in order to get results!!! Ask yourself. Is my cup empty and am I ready to be coached? Do your research, check qualifications and then when sufficiently impressed, give your trainer a little faith. If you don’t give them a chance it will never work! Take advice and then actually follow through on it. When you have acted on it, then go back and refill your cup. Remove the negatives. This means activities that have broken down your body over the years that are injuring you or the diet that is killing you slowly or removing the hecklers and saboteurs from your social network that continue to keep their foot on your head when you are trying to step up! Be consistent for while. If you don’t show some patience, persistence and perseverance with anything you won’t get a result. Why is it any different for training or coaching? Why ask for a trainer or pay for one if you are not ready to immerse yourself in the process? The bottom line: there’s a right time and place to benefit from advice and training. If you’re not in that time and place, there is no benefit. You must earn the right to a receptive mind. So, before asking anyone for advice or training, make sure you’re ready to receive it. Category: Uncategorized Comments Off on Are you actually ready for training, coaching or advice?